Nº CATALOGO 034.- EDAD 2 AÑOS Y MEDIO, COLOR JABALÍ, ELEGANTE, CON CABEZA FEMENINA Y EXPRESIVA, INMEJORABLE CALIDAD DE PELO, DISTANCIA DEL SUELO CORRECTA, PECHO PRONUNCIADO, ANATÓMICAMENTE CORRECTA, CONVENCE TANTO EN EL MOVIMIENTO COMO EN PARADA, CARÁCTER MODÉLICO. PUNTUACIÓN: EXCELENTE 1º (CLASE ABIERTA) C.A.C., MEJOR DE RAZA, MEJOR TECKEL NACIDO EN ESPAÑA Y MEJOR EJEMPLAR ABSOLUTO DE LA EXPOSICIÓN MONOGRÁFICA 2006 (ADULTOS). "BEST IN SHOW". I PREMIO CON 100 PUNTOS (SOBRE 100 POSIBLES). 1º EXCELENTE Y CACT: "Ch LAIKA DE PRIGARCÁN". 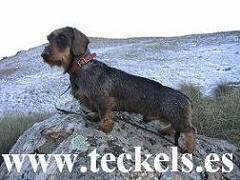 TECKEL STANDARD DE PELO DURO, CONDUCIDA POR ANGEL PRIETO, QUE A SU VEZ ES EL PROPIETARIO Y CRIADOR. RECORRIDO SENCILLAMENTE IMPECABLE. DESDE UN PRIMER MOMENTO "LAIKA" TOMÓ EL RASTRO SIN VACILACIONES, RECTIFICANDO EN MUY CONTADAS OCASIONES ELLA MISMA, CON UNA CONDUCCIÓN EXCEPCIONAL POR PARTE DE SU GUÍA. EL TRABAJO, CONTINUO Y TRANQUILO DE "LAIKA", Y ESA CONDUCCIÓN, LES LLEVÓ A MARCAR LOS GIROS SIN NINGÚN TIPO DE PROBLEMA, Y FALTANDO UNOS 200 METROS PARA "LA MUERTE", AMBOS DEMOSTRARON SU COMPENETRACIÓN AL LEVANTARSE UNA LIEBRE; CON DOS PEQUEÑOS (AUNQUE FIRMES) TOQUES DEL CONDUCTOR, "LAIKA" VOLVIÓ AL RASTRO, Y A LOS POCOS METROS, YA VENTEABA "LA MUERTE", CONDUCIÉNDONOS A LA MISMA CON PRECISIÓN, Y DEMOSTRÁNDONOS CÓMO UN TECKEL SABE HACER SU TRABAJO, TOTALMENTE EN EL ESTILO DE LA RAZA. ¿QUÉ MÁS PODEMOS DECIR? ; LA ALEGRÍA HA SIDO INMENSA Y LA DECISIÓN DEL JURADO UNÁNIME. EL TRABAJO HABÍA SIDO ABSOLUTAMENTE DE CACT. EMPLEÓ UN TIEMPO DE 45 MINUTOS.